MACOMB, IL -- Five bucks. Five bones. Fiver. Five clams. That's all it takes to help a good cause. 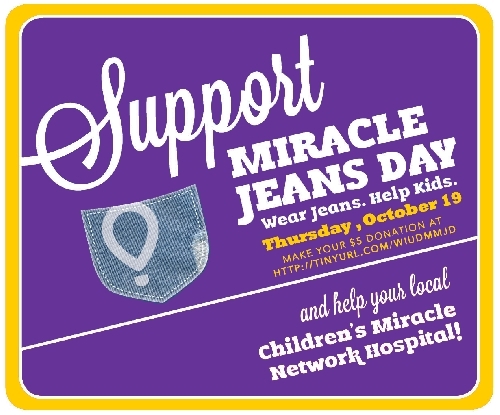 On Thursday, Oct. 19, Western Illinois University employees are invited to participate in the WIU Dance Marathon's second annual Miracle Jeans Day, with proceeds of the event going to St. Louis-area Children's Miracle Network Hospitals. Approval has been granted for WIU employees in all departments to participate in the special "wear jeans day," if they choose. For a minimum donation of $5, WIU employees can put their professional attire aside to wear jeans to work. The $5 jeans donation, which is due by Oct. 17, may be made online at http://tinyurl.com/WIUDMMJD (click on "Support Me") or by cash or check (payable to WIU Dance Marathon), sent to Nick Katz, associate director of Student Activities and WIU DM adviser, c/o the Office of Student Activities (University Union). Special "MJD" stickers will be distributed Oct. 18. More information about Miracle Jeans Day is available at miraclejeansday.com. Another Miracle Jeans Day will be held during the Spring 2018 semester. The WIU Dance Marathon (DM), which is a recognized student organization, has a series of yearlong fundraisers taking place for Children's Miracle Network Hospitals, the organization's designated charity. The fundraising events culminate Feb. 24, 2018 with a 12-hour Dance Marathon on campus, which honors the 12-hour shifts of doctors and nurses, as well as children who are unable to stand. For more information on the WIU Dance Marathon, visit facebook.com/WIUDM or email DM Board Member Mackenzie Lyons at MR-Lyons@wiu.edu with any questions.